We’ve redesigned our three most popular back saws to feature a slight tapering of the blade from toe to heel. This taper gives you better control over precise cuts. When you reach the gauge line on the front of your stock, the blade is slightly above the line on the back side, which reduces the risk of sawing past your line. In addition, the taper introduces an angled approach to your stock (when holding the saw back parallel to the bench), enabling faster cuts with less effort. The cutting depth is 1-3/8" at the toe and 1-5/8" at the heel. The saw plate is .015" thick. Teeth are filed rip, 15 ppi, set at .003" per side. Overall length, including handle, is 15", with a blade length of 10". You will find that your saw is a joy to use. Unlike most saws on the market, every Lie-Nielsen saw has been precision set, filed, and test cut in hardwood before it leaves the shop. The first thing you’ll need to know about your saw is how to hold it. This may seem obvious, but many people try to wrap all four fingers around the handle. The proper grip is to wrap the middle, ring, and little fingers around the handle with the forefinger pointing along the Brass back. You’ll discover that in doing so, you will have much better control over how your saw tracks, and it will also feel very comfortable and natural. Your saw is very sharp when it arrives. 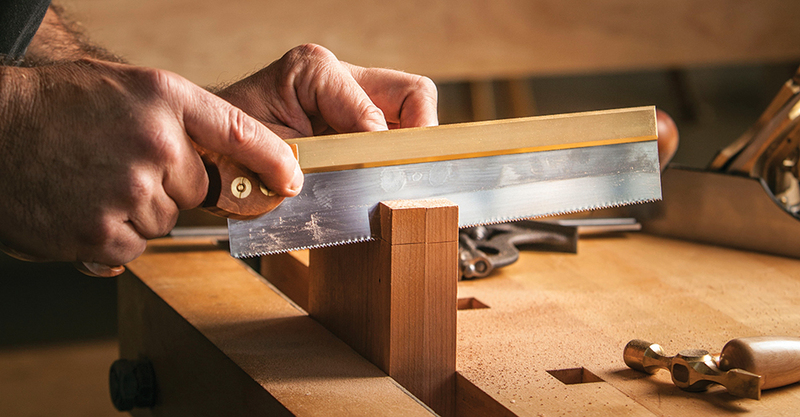 When starting a cut, hold the saw blade so it is flush with the top of the stock. It is not necessary to tilt your saw at an angle when cutting. Best performance is obtained by sawing slowly and evenly with very little downward pressure, using as much of the blade as possible. Your saw will track right to the line. Be aware, however, that due to the slight set, your saw will be hard to correct if it starts to cut away from the line. If that happens, it’s because you didn’t line it up properly when you started. Practice on some scrap wood to acquaint yourself with how your saw cuts. If you had a poor sawing technique before, your new saw will force you to learn the proper sawing technique. Don’t worry — once learned, it’ll be smooth cutting. If your saw seems to “grab” the wood and jump around in the kerf, you’re using too much downward pressure. Ease up a bit and take long slow strokes. The Split Nut Bolts on our open handle saws require a special Split Nut screwdriver to tighten or remove. Closed handle saws have a conventional bolt and nut. Split Nut screwdrivers (No. 2) and the slotted screwdrivers designed to fit our Tenon Saw nuts (No. 3) are available from us. The steel in your saw's blade is the best that's available. It is very hard (50-52R) and will stay sharp a long time. Eventually, however, you'll have to sharpen it. You can do this easily yourself with a little practice. We use a 6" double extra slim taper file to file the teeth on our Tenon Saws. We use a 5" double extra slim taper file to file the teeth on our Carcass and Dovetail Saws, and you can do the same if you're skilled at filing. If not, start with a smaller 4" extra slim taper file, which will make it easier to line up the file with the gullet for beginning filers. Take a couple of pieces of thin, straight scrap and clamp them in your vise on either side of the blade so that the top of the scrap is flush with the bottom of the gullets on the teeth. Take your file and take one swipe per tooth. Notice the small groove the file leaves in the wood. This is a good gauge to show you how deep you're filing. The teeth are so fine on your saw that no more than one pass per gullet should be necessary. If you use this method consistently, you shouldn't ever have to joint your saw. Of course, Dovetail and Tenon Saw teeth are sharpened to a rip profile, so you can file all the teeth from the same side. You can use a Stanley 42X saw set on our saws. The Stanley set may vary from ours, so experiment on a small area before you do the whole saw. Your Carcass and Dovetail Saws only need approximately .003" set per side, and Tenon Saws only .004" per side when properly set. The slight set is what makes the saw cut and track so well. If done improperly, you'll notice a drastic decrease in performance. You should only have to reset your blade after every other sharpening, not every time. The ultimate test of any setting job is how well the saw cuts. Take some scrap and start a cut. The saw should glide through the wood without jumping around in its kerf. It should not be hard to push, nor should it be roomy in the kerf. If either of these conditions exists, increase or decrease the set accordingly. If the saw tracks away from the line, the side on the saw that is furthest from the line has too much set. A simple remedy is to lightly stone the edge of the offending side with a medium India slip stone. Take one swipe with the stone, and try another cut. Usually only one or two passes with the stone will correct the problem. Don't remove too much, however, or you will have the same problem on the other side until not enough set is left to make a cut. Once you have determined by trial and error that you have just enough set on that particular saw, make a note of where your saw set is adjusted for future reference. You may also send your saw back to us for sharpening. Visit our YouTube channel for more tips on saw sharpening. We believe that our Back Saws are the finest made anywhere. 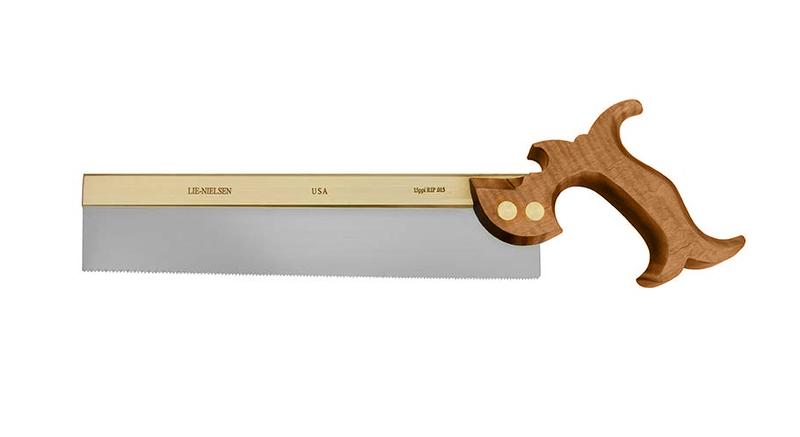 Solid milled Brass back, best quality Swedish Steel blade, Curly Maple handle and traditional Brass saw nuts and bolts. It is a good idea to keep a coat of oil or silicon spray on your saw's blade when not in use. This will minimize the chance of rust forming on the blade. The blade is high carbon steel with no rust-inhibiting alloys added. 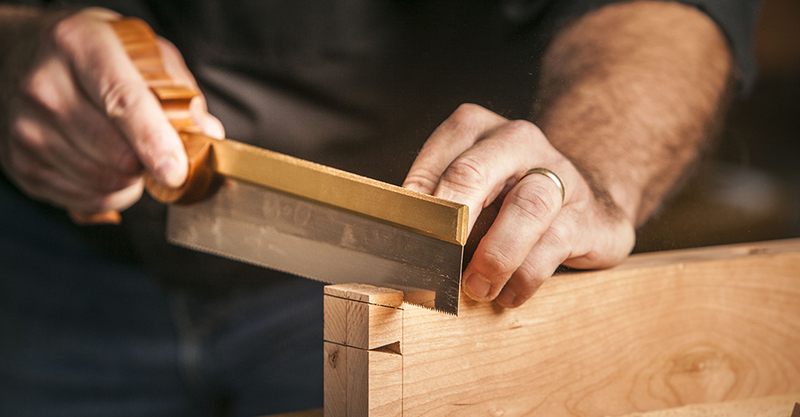 The handle on your saw is oiled and buffed with wax to produce a natural finish. Wipe with oil as desired to refresh. Proposition 65 Notice: Bronze and brass alloys contain lead, a chemical known to the State of California to cause cancer and birth defects, or other reproductive harm. Wash hands after handling.